There's a way for you to perform multi-tasking jobs with your Samsung Galaxy S5. 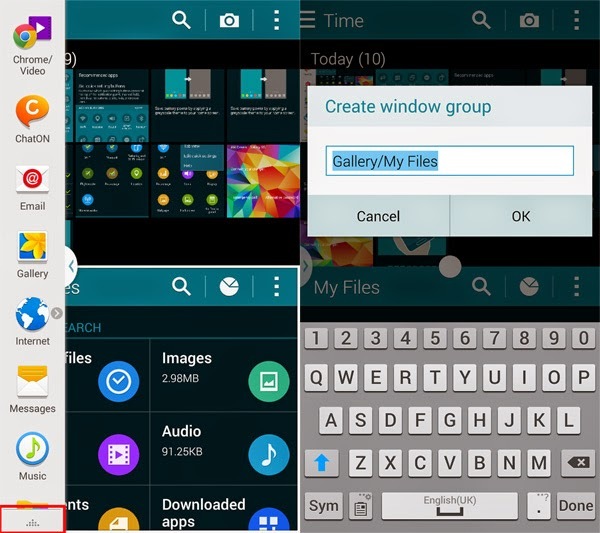 With the phone's Multi-Window feature, you can easily complete multiple tasks on one screen. This means you can browse the web and check your email simultaneously. The Multi-Window tray also has the most commonly used apps for you to choose from. Isn't that great? Read on this simple guide if you need further assistance in this setup. 1. In order to get started, open the Quick Panel. Use your two fingers and swipe down from the top of the screen. 2. Turn on Multi Window by touching the Multi Window Quick Panel shortcut. If you see it turns green, then that indicates the feature is already enabled or activated on the device. 3. Now open the Multi Window tray by touching the Arrow at the left side of the screen (left edge of the (Google search bar). If you want, you can change the location of the Arrow tab. To do so, touch and hold the tab, then drag and drop it to anywhere you want in the screen. You can also hide/show the Arrow tab when Multi Window is enabled. Just touch and hold Back and that should do it. 4. The next screen contains a tray of app icons. Touch and drag an app from that tray to open it in a Multi Window view. To drop the app into place, just release it. So basically, it's just a matter of dragging and dropping of the apps you want to use in a multi-window. An indication of where the app will appear on-screen is the blue overlay. Take that as your hint. 5. Now touch and drag the next app from the tray, then drop to open it in a Multi-Window display. 6. To reveal or show the Multi Window icons, touch the split bar in the middle. If you want to resize windows, just touch and drag the split bar up or down. 7. The Multi-Window icons will generally swap the location of the apps from the applications from left to right, as well as enable drag and drop of a screenshot or paragraph of text to other window, or close the active window. 8. To go back to the Home screen, just press the Home key. 9. Apps that appear in the Multi Window tray can also be modified or edited. To do so, touch the Arrow to open the tray and start modifying apps as you desire. 10. To reveal editing options, touch the More icon. 11. Touch Edit to proceed with a detailed modification. 12. You can add or remove an app in Edit mode by dragging the icons in and out of the tray. You can also change the order they appear in the tray by dragging them to your desired place. Once you're done editing apps, touch Done to save your changes. Again, please note that only those applications in the Multi Window tray can be used in Multi Window view. So be sure to add the app you want to use in the tray beforehand.